The weekend 9 and 10 november 2013 was all about sharing experiences and the General principles in Budo. For this special occasion great masters from Sweden, Switzerland and France came over. They arrived in the course of Friday. The Board treated them in the evening on a warm welcome to the dojo with a delicious dinner. After dinner, ideas were exchanged and the program was being completed. The next morning the day started early. At nine o'clock the Gasshuku started. All guests and participants were being welcomed. Afterwards, the morning was filled with two workshops. 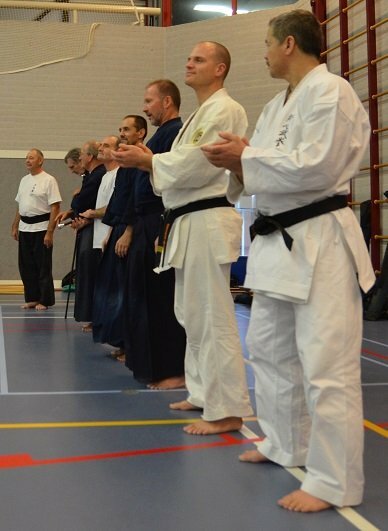 The first was provided by Shihan Jan Kallenbach assisted by sensei Hans Bakker and sensei Etienne Graanoogst. The second was provided by SMR Menkyo Kaiden Pascal Krieger assisted by SMR Menkyo Kaiden Fred Quant. The atmosphere was very cordial, open and was featured by a sense of belonging. This was followed by a well deserved and well cared for lunch. The attendees enjoyed the lunch and took into good account the afternoon program. The afternoon program consisted also of two workshops. 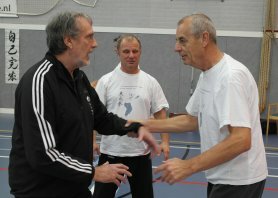 The first was provided by Shihan Michael Söderkvist assisted by sensei Lars Sjöberg and sensei Rob Quant. The attendees were surprised with a very interesting workshop. They were being introduced to an entirely different facet of the Kyokushin karate than expected. Shihan Marshall McDonagh had the honour of the final workshop of the day to take care of. This he began with a reflection of his experiences of the last few years. The fight against the invisible opponent. 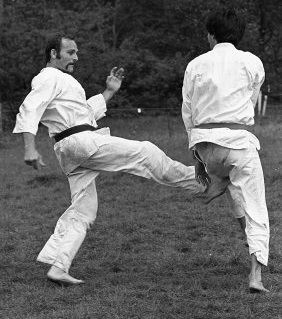 Also in this fight Shihan Marshall McDonagh knew to handle the principles of budo. He closed the workshop with a playful practice session, after which the first day ended. All participants followed each workshop and were introduced to the General principals, views and interpretations of the Grand Masters. All participants left the room with a satisfied feeling of enrichment. Sunday, two more workshops completed the Gasshuku. Pascal Krieger this time assisted by Jean Luis Martin had the honour to present another very interesting workshop. This time he went in on kenjutsu and presented the attendees a variety of techniques with explanation, after which some could be practiced with each other. 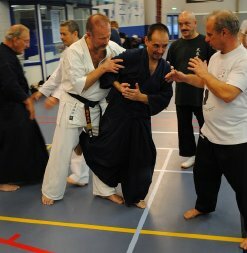 Also now there was again a great open atmosphere with a special budo-spirit. All pounced totally on the offered exercise material, where those in the know offered the others their help and knowledge spontaneously. The last workshop was to Jan Kallenbach. In this workshop, a number of aspects which were central earlier in the weekend, were approached from a different point of view. 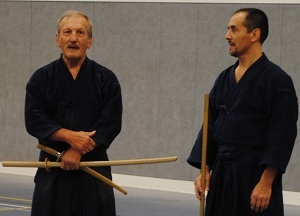 Those present could again in a completely different way get to know the possibilities that Tai Ki Ken and budo offer. Also during this session a variety of surprising exercises was offered to the the attendees. 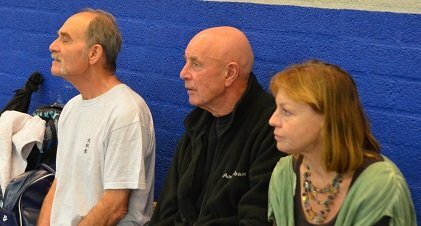 At the end of the Gasshuku shihans Marshall McDonagh and Jan Kallenbach let us join and practice their versions of the kata Ba Duan Jin. 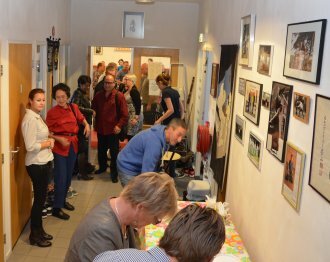 The Gasshuku was closed in a very relaxed way and all participants went home with a very enriched feeling. Frank Hoekzema wasn't able to participate and excercise, but he sure did shoot a lot of nice pictures. Frank, a lot af thanks for that from all of us! Hans Everts also shot very nice pictures, Click here for his photo's. On behalf of Yoshinken Sweden, I congratulate the Shin-Shinbuken Budo Team for the excellent Gasshuku which contained ALL of the important ingredients of modern BUDO as it should be. The good feeling experienced will last a long time and further efforts in never giving up in personal development, with humble respect, strong "KI" and influence the coming generation with these special values. Pascal and Fred performed incredible embu. Thanks for sharing the great weekend. The budo spirit was very strong - see you next time! Thank You for your hospitality and great time we had together. I think our seminar worked out very well as I heard from the participants. A big thanks to you and your friends in Shin-ShinBuKen for the Gasshuku, it was really nice to meet with the Jo and Karate people. But it's so with Budo people, it is always nice. 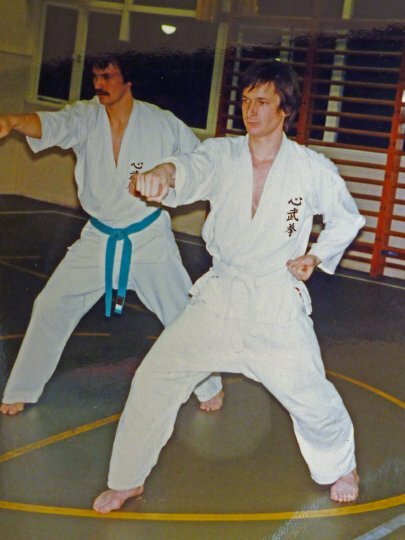 And now remember Rob that you promised to come and train TaiKiKen with me next time I visit Shin-ShinBuKen. Nur ein mal ich bedanke mir auch für mein Deshi Olivier für diese zwei fabelhafte Tage in Amsterdam. Das war sehr Lehrhaft mit andere Leute von Taikiken Kenpo, Kyokushinkai und Jodo das keiko zu folgen. Domo Arigato Gozaimashita. Wir bleiben in verbindungen, wie immer. Osu! In the name of all ACBB Taiki members, i would like once again to thank you for this great week-end. The martial content and the human links were so rich. And so long time since we didn't see Jacques Sensei so happy, enjoying, living and speaking that way! We had an inspiring gasshuku this weekend. 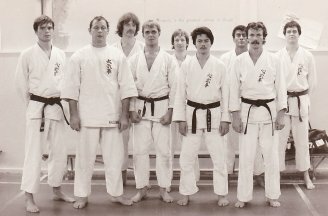 For those who want to: it would be nice to be ready at 20.00 hours and start with some kumite. Thank you very much for your hospitality and for hosting us during a very successful gasshuku. It´s an honour for me to participate. It was nice to get to know you and I hope that we can stay in contact in the future. We keep in touch. Hello Fred, I had a nice trip back. A little tired but extremely happy about this wonderful gasshuku, meeting with such old friends as Marshal and Ian. Thanks for your wonderful hospitality. See you in some 50 days. Pascal Krieger Merci Ian, yes, let us go on. I had a great time. Take good care of yourself, my friend. Have a good end of the year. 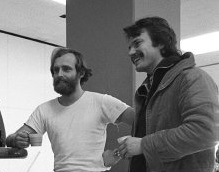 Pascal Krieger. Jullie kunnen terug kijken op een meer dan geslaagd jubileum. Het was geweldig, en wij vonden het een eer daar deel van uit te mogen maken waarvoor nogmaals dank. Finally back in safe, only my weapons left in Amsterdam, but since then KLM brought them back to me. Thank you again for the invitation and also for your hospitality, even staying in your family circle. Altough I was the only one Hungarian there, but never felt alone or bored during those days. It was very nice being there and do cross-training. I realized that I have learnt couple of things again. Please, give my best regards to the organizers and the folks around, as well. Saturday 28 september 2013 we celebrated that 40 years ago the Foundation was laid for our Association. The day started with the training Tai Ki Ken, which on this day was open for interested parties. After the training the attendees could get to know each other in a casual atmosphere and exchange experiences. Loïs and Maurice Quant guaranteed an excellent care of the inner man. More and more (former) members and invited guests gathered and made themselves on for the sequel. 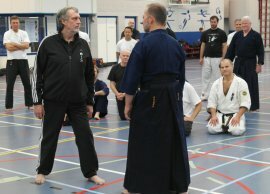 With a beautiful slideshow Shihan Kallenbach gave the attendees an impression of 40 years Shin-ShinBuKen. 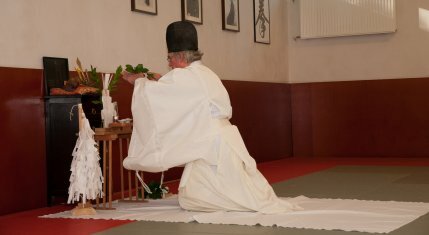 After the opening and slide show it was time for the Shinto-lesson followed by an initiation ceremony by Shinto-master Paul de Leeuw. Click here and see the super cozy reunion, for which we are very grateful to the attendees!! At the end of the ceremony it was again time for cosy sharing experiences while enjoying various refreshments and hot snacks. The attendees enjoyed plenty of as time flew by. It wasn't long before we had to move to the party Center. There the day continued with even more former members who exhanged memories and experiences. 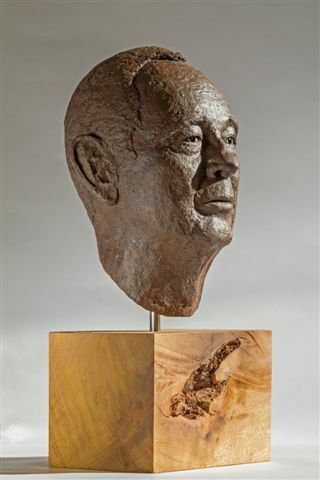 The evening had another surprise in store by jodolid Frank Hoekzema, who presented a fine craftsmanship of modeling to the Board, a bust of President Jan Kallenbach. The attendees were all very impressed by the way in which Frank created the image, what a particular masterpiece!! The evening was further completed with various anecdotes in a nice casual atmosphere. On behalf of the board of Shin-ShinBuKen I want to thank the President of Karatedo Bond Nederland, Sensei Takahashi, all Shin-shinBuken Members, my fellow Boardmembers...and of course some unforgettable TaiKi members and former ShinBuKenners for their attention, presence...and efforts on our 40 Years ShinBuken Party last Saturday in our Dojo and the Halve Maen. Your presence felt very good and made this happening unforgettable for us. We were very happy, sometimes astonished and moved by all this attention and nice presents we received as Board of Shin-ShinBuKen and personally. In my memory those 40 Years went by as a 'shot arrow' ...with this difference, all could see our arrow finally did hit our mark, and after all we can state our efforts during those 40 Years have not been in vain. Thank you for your personal efforts to give our 40 Years content and a good form...it's good we could share all this and it is super you helped us celebrating it. A nice gift for the shihan during the celebration of our 40th anniversary. David Roovers, President of the Karatedo Federation Netherlands (KBN), made for a special surprise. David came to the dojo especially for this special promotion. He had the pleasure on behalf of the KBN to promote Shihan Jan Kallenbach to 8th dan KBN. 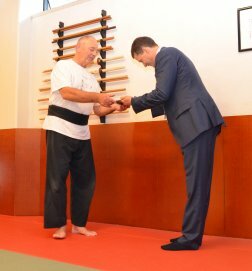 He looked back on a nice track record and welcomed the versatility of the all-round Budo practitioner Shihan Jan Kallenbach. Ik stond in de dojo tegenover onze lange zeer getalenteerde jonge Surinamer (helemaal rechts, heette hij niet Hans of zoiets? Ik noem hem even X) in een rondje "vrij knokken". Hij was extreem lenig en had een verwoestende mawashi. Daar was ik op bedacht en wist die een aantal keren af te weren. We waren lekker bezig, tot er ineens een tegel uit het plafond op mijn achterhoofd viel, waardoor ik knock out ging. Toen ik bijkwam, was X vreselijk geschrokken, hij maakte duizend excuses, vroeg hoe het met me ging etc. Waarop ik dus vertelde dat er een stuk van het plafond op mijn achterhoofd was gevallen. Hij zag dat kennelijk anders, hij beweerde dat hij me met een trap geraakt had op mijn kin. Ik geloofde er niks van. Maar het bewijs was er, een flinke scheur in mijn lip. De smeerkees had me met een prachtig gecamoufleerde trap van schuin onder neergemaaid. Onze tandarts (Y; sorry, slecht geheugen voor namen) heeft me in zijn auto geladen en in de tandartspraktijk in Zaandam mijn lip keurig met naald en draad opgelapt. We stonden op de paasheuvel in Vierhouten, 's ochtends erg vroeg. Het vroor. 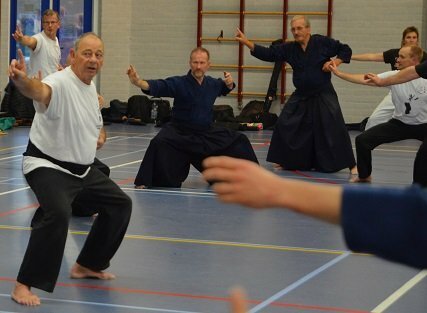 In karateg, blote voeten (geloof ik) met z'n allen fijn Zen staan in de richting van de opkomende zon. Mijn handen vroren van mijn lijf. Ik dacht: "At ease mate, laat gaan en je voelt er niks van..." Dat was niet zo. Ik stierf het af van de kou, alle gevoel verdween uit mijn handen. Heb stiekem om de beurt mijn handen onder m'n oksels gestoken. "Ik geloof dat ik zeker weet dat ik dit eigenlijk helemaal niet wil....", dacht ik. Dat heb ik natuurlijk nooit aan iemand verteld. 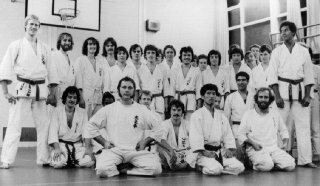 Een anekdote die ik me zelf niet meer kan herinneren, maar Frank Heckman vertelde me dit vele jaren later: ik schijn bij een van mijn eerste keren in de dojo, met mijn (niet al te zware) judo-achtergrond Jan Kallenbach onderuit geveegd te hebben, die met een daverende dreun op z'n rug ging. Dat heb ik geweten, hij heeft me vervolgens alle kanten van de dojo laten zien, aldus Frank. Ik weet dus echt niet of dit waar is, zou je bij Frank moeten checken. Van Vierhouten kan ik me ook nog wel goed onze Franse gasten herinneren, dat waren supersporters, van ijzer en heel goed. Een laatste herinnering: ik deed examen voor een van de banden, en moest een kata doen met een tegenstander (heet dat dan ook een kata? Nu ja, je weet wel). Als ik me goed herinner was Fred Quant mijn slachtoffer, kan dat? Ik was zo waanzinnig geconcentreerd en overtuigend bezig, dat ik me pas aan het eind van het ritueel realiseerde dat ik hem echt de stuipen op het lijf gejaagd had. Jan vond het prachtig, dat weet ik nog wel. Fred Quant iets minder, maar hij was er snel weer overheen. Hier een foto uit de tweede fase van onze ShinBuKen bloeitijd. De Zweedse nationaal karate kampioen Jack Lindau, uit Landskrona komt bij ons mee trainen. 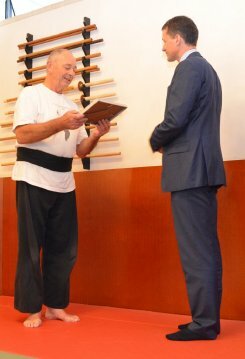 Jack, Kyokushinkai karate man, presteerde goed op de Europese Karate Unie wedstrijden en kwam zich bij ons in ShinBuKen voorbereiden. Een prachtige tijd, met vlnr. 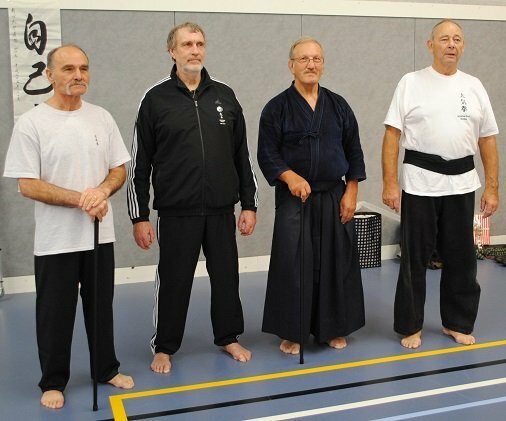 Hans Paulich (Sheffield, UK, komt op onze receptie); sensei Jan, in kenpo-gi; daarachter Hans Everts (Geneva, traint nog steeds, komt ook); voor hem staat Jack Lindau (Zweden); daarnaast Steven de Bie (co-auteur met Frank Heckman van ' de Reis van de Held' ); sensei Rob Quant; achter hem: Pedro Jie Sam Foek (verhinderd); Frank Heckman, (de Reis van de Held) en gastdocent en Haske Verheijen, traint nog steeds. 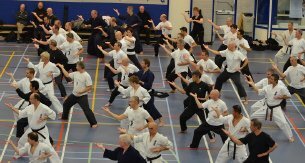 Achter onze hoofden een spreuk: " modesty is the greatest virtue in Budo"
Shinto Muso Ryu Jodo conducted by Fred Quant SMR-jo Menkyo Kaiden. We would like to share this moment with all the members and former members during a casual reunion on saturday September 28, 2013. Have you been a member of our association or former Club Kallenbach and Shin Bu Ken? Are you interested in how others have developed and what they are doing today? Do you want to share your experience with us? Please fill in this form and we will place your additorial. Marquee by Dynamic Drive click here.